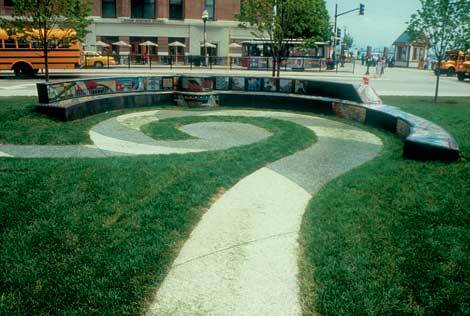 The form of this bench, the easternmost, wraps around the terrazzo path where it spirals into a circle, suggesting the water basins at each end of the canal. The turning basins made it possible for the 100-foot-long canal boats to turn around and begin their journey back to the other end of the canal. The various forms that make up the bench are drawn from gears, axles, and other industrial references. The mosaics suggest specific moments in the industrial history of the canal, and the way in which the land’s industrial uses continue to be framed by the landscape’s natural beauty. The bench’s outer walls are covered with handmade ceramic tiles in shifting hues. The colors, suggesting an Illinois field, range from the fresh greens of spring to the deepening shades of autumn; colors of native wildflowers are also included. Each tile was made by a canal corridor resident, imprinted with a memory of the place. On the outer seat are oversized mosaic flowers representing familiar Illinois plants. While plants such as the sunflower and the white dogtooth violet are native to Illinois; others such as the chicory and the dandelion are (like many of us) immigrants who have put down roots in the prairie. The images on the interior bench seats and on the back suggest the tremendous productive capacity of the canal corridor region. Opening the section is the iron plow, which made agriculture possible on prairie lands. Grain, raw materials, and energy flow from one end of the bench to the other by water, rail, and truck. Where are the people in these images? A line from a Julius Lester poem reminds one that “Everything is somebody.” All of the breaking and making is connected to the life energies of real people. In the square vignettes on the south back section are some of the people who have contributed to Illinois’ productivity: a weary coal miner, a young woman painting a radium clock dial, a laboratory worker, and a woman construction foreman. The two hands holding bread and roses symbolize workers’ needs to have both sustenance and leisure in their lives. The image of the clock-dial worker recalls a still unfolding saga in the life of the canal town of Ottawa. Beginning in the 1920s, decades before the hazards of such a practice were known, dozens of young women working for the Radium Dial Co. (later, Luminous Processes) suffered illnesses--some eventually dying of cancer--because of their contact with the radium-laced paint used for glow-in-the-dark clock faces. It’s a sober reminder that our seemingly endless desires for new and More Things can have tragic consequences. In a spiral that echoes the spiraling path, the crowning text of the piece reads Taking From, Giving Back. The artists have dedicated this bench to the hope that, as we continue to utilize and benefit from the productive capacities and pleasures of the Illinois landscape, we will learn to protect and give back to the land that sustains us.